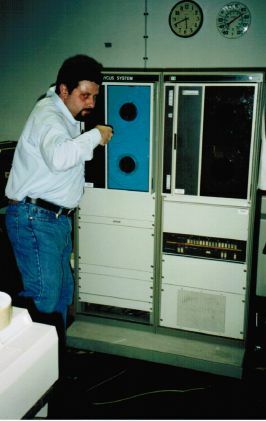 The Ibycus computer was what Thesaurus Linguae Graecae data crunching got done on throughout the 1980s and 1990s. 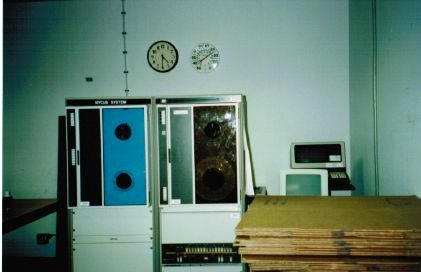 It was the stuff of legend, an HP 1000 customised in David Packard Jr.‘s garage, with spelling and format checkers and text editors in assembler, that crunched through tens of millions of words of Greek in its own temperature controlled room. It’s also the stuff of legend featuring in the “Lernaean Text” (or Hellenic Quest text), the long-running and indefatigable distorted urban legend doing the rounds of the Net for years, claiming that Ibycus (or Imycus) has determined that Greek has 90 million* distinct words. It also says that Bill Gates wants his programmers to program in Ancient Greek, John Sculley is still running Apple and publishing with CNN (?) the Hellenic Quest software to teach the world Greek, and Greek words have deep cabbalistic meanings and no arbitrariness of signs. That’s why Nikos Sarantakos calls it Lernaean: however many times you cut off its head (including refutations by the TLG itself), it keeps coming back, because enough people want it to be true. I actually have a 'baby Ibycus' in my office at work. I work in instructional technology specializing in foreign language education. I inherited the Baby Ibycus from my predecessor and couldn't bring myself to toss it out. I don't have the keyboard, sadly. But I've always wondered if there was one that I could find to complete the machine. It's part of my museum of foreign language software. Those photoshop manipulated pictures won't be able to hold back the New Hellenic World Order. We all know that, in reality, Ibycus has the size of the Empire State Building and is able to run the most sophisticated calculations in mere nanoseconds. Furthermore, it can never become obsolete as this would bring great unease to the authors of the lernaean text. Despite the above mentioned known facts, thanks for this wonderful post. @ Dokisaki aka greekchesspolitics, ευχαριστώ για τις επισημάνσεις, και έκανα τις δέουσες διορθώσεις. Ήθελα να συσχετίσω το «90 λέξεις» με το «μόνο τρεις λέξεις ξέρουν ποια οι νεοέλληνες, μα…, γα..,» και ξεχνώ το τρίτο. Αλλά δεν μπόρεσα να βρω ποιος το ‘πε το αθάνατο…. Το «γερά μπράτσα» πάντως θα το πάρω μεταφορικά! 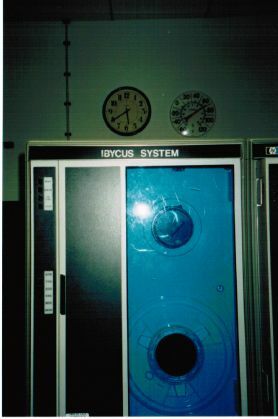 @ Notis, there were indeed “Baby Ibycus” machines, also I think out of David Packard’s garage—custom machines at any rate, which could read the TLG CD ROM before commonplace PCs could. I’ve seen them—they were ’80s-looking terminally things, but I know little about them, and there’s only a couple of very very old hits on google. I’ve never used either machine, it has to be said. I’m reproducing your link from the magnificent Nikos’ Sarantakos Blog to the Greek online interviews with Brunner, MacDonald, and Pantelia; I was unaware of it, and it’s a fairly thorough overview of the history (in Greek). 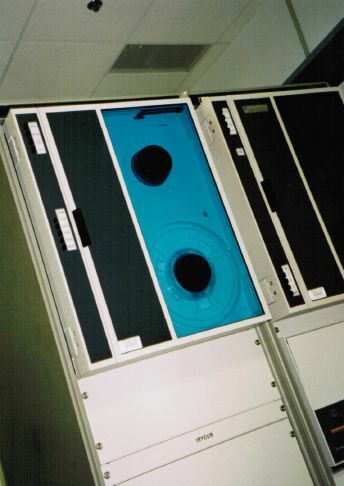 The reverse engineering of the CD ROM was a large chunk of 1999, and it was decidedly not fun. Wasn’t there also a desktop computer called “Ibycus”, or am I totally wrong there? I remember using this during my undergrad years in Thessaloniki. Any clues? Τώρα ανακάλυψα και αυτή την ιστοπαρουσία σου! Ενδιαφέρον άρθρο, απαραίτητο για τον αντιλερναϊκό πόλεμο, εντυπωσιακές φωτογραφίες, και απόδειξη ότι η πνευματική εργασία θέλει και μπράτσα γερά. Στη 2η παρα εννοείς βέβαια 90 εκατ. ξεχωριστές λέξεις (υπάρχει κι ένα διπλό texts texts) στην 4η. (Πέταξε σε παρακαλώ αυτό το κομμάτι του σχολίου μου, δεν αυτοκαταστρέφεται).